A Judge of this quality in the mould of Coke, Mansfield and Coleridge: all Lord Chiefs and Goddard himself a brother Judge to the esteemed and Honourable Mr Justice Denning, Lord Justice Denning, and Lord Denning is rarely seen in England. He was observed clearly from 1946 to 1958 in the role of Lord Chief Justice thanks to Clement Attlee our then Prime Minister. That great Labour leader shone the light on Rayner Goddard who then strode the moral high ground of English criminal jurisprudence as Attlee himself bestrode the highest reaches of social and economic justice from 1945 to 1951. One of the hallmarks of the Old School Judges and lawyers was their determination to be visible and audible and their refusal to be faced down and trampled upon. Nowadays the culture of political correctness and the effects of the European Courts with the Human Rights Act regime of the 1990’s and later, make it very difficult, indeed practically impossible, for our modern Judges to have this stand out quality, whatever their ambition and character. The vogue amongst our Attorney-Generals and Law Officers post 2000 is also to go “softly softly” and avoid controversy. I am concerned with the Attorney-General, as in the 1940’s the Attorney would normally step up to be Lord Chief Justice when the previous incumbent retired. In 1946 the Labour Attorney-General was Sir Hartley Shawcross MP who declined the promotion to this high judicial office. Goddard had ventured into politics himself in the 1929 election and lost badly as an unofficial Conservative candidate on the “purity Goddard” ticket. He was opposing the sitting Conservative MP who had been cited as Co-Respondent in a sensitive divorce suit. Goddard was a true purist in criminal jurisprudence as he proved as Lord Chief Justice from 1946-1958 appointed by our Prime Minister Clement Attlee MP. Attlee was his own man and the Lord Chief Justice was a political appointment in the 1940’s. Attlee made the choice of Goddard confident that as a Lord of Appeal in Ordinary he had the clout to deliver as Lord Chief – the top Judge in Criminal law, then and now. He wanted this Judge with resolve for this office as his own administration was such a powerful reforming government, and there was a lot at stake in parliament and the Lord Chief Justice’s Court. 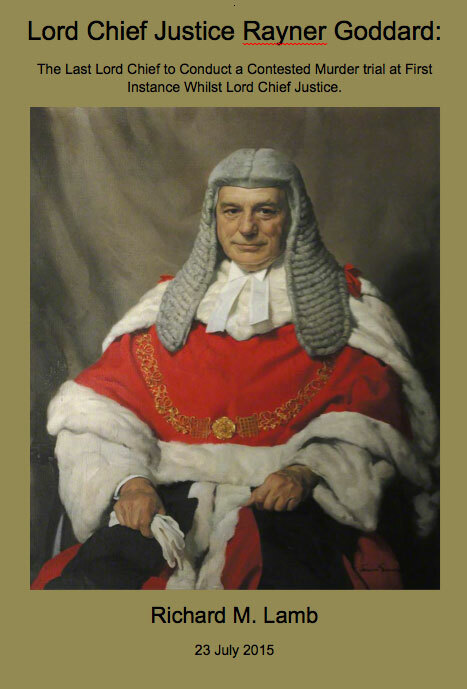 Attlee got what he wanted – a Lord Chief Justice in Goddard, who would be as memorable as his own radical government in the decades to follow. The work of our modern Lord Chief Justice since the War is largely Appellate, hearing Appeals against conviction in jury trials and Appeals against sentence form Crown Court Judges’ sentences (used to be the Assizes pre-1970). In Goddard’s tenure of that office this pattern emerged. He speaks with great sincerity and honesty. Yes after he died certain very Senior Judges quashed the famous Bentley’s conviction posthumously in 1998 at whose trial for murder Goddard presided at the Old Bailey in 1952. What can I submit? This Appeal was lacking in reality and driven by an out of Court publicity campaign. You cannot properly conduct such an Appeal 35 years after the Appellant had been hanged. There was no life in this Appeal and justice clings to life always. Goddard had performed his judicial obligation in the 1952 Bentley and Craig trial. Bentley went to the gallows on 28 January 1953. Goddard’s reported comments on this case in his retirement do not sound authentic, some being on the internet. The persons responsible for circulating these remarks demonstrated a lack of respect for this judicial office in the hands of this esteemed Lord Chief Justice now deceased. You either support our High Court Judges since the war or cause denigration to fall upon them. The latter is unthinkable. Those who are not prepared to come into line had better fall silent or bring obloquy down upon themselves, our noble Queen and her Judges. What capitulation! In this case Goddard took it upon himself to try these two accused for Capital Murder, handgun fired upon a police officer, when he was the most Senior Criminal Judge in England and Wales as Lord Chief Justice. He correctly ruled the evidence pointed to aiding and abetting or joint enterprise in modern parlance. The purpose, which joined the accused, was to burgle the factory concerned and resist arrest, if need be, both actions with the handgun. Craig (16 years) fired the handgun to kill the police officer on Bentley’s instruction. If Bentley (19 years) wished to stop the fatal shot being fired why did he not tell the younger man to drop the gun when the police officer appeared on the scene? Another officer was also wounded by a bullet fired by Craig in this crime scenario shortly before the fatal shot was fired. The agreed facts of these shootings and Bentley’s proximate actions to the murder meant that he, Bentley, was guilty of aiding and abetting the unlawful killing of the police officer by Craig. Goddard presided with the full authority of a criminal trial Judge and Bentley was properly convicted of capital murder and sentenced to death. The Jury were permitted the final say and Defence Counsel for Bentley would have addressed them to secure a manslaughter verdict rather than a murder conviction. Counsel failed in that plea. The Jury convicted of murder, but made a plea for mercy in respect of Bentley. I should admit under my vision for the restoration of the Death Sentence there will be no judicial executions for murders committed by those less than 21 years. Thus under the regime I project, Bentley and Craig would have both been spared automatically. Goddard under the Law, as it stood, had to spare Craig. It takes great judicial skill to judge the simplest of cases, e.g. Bentley and Craig’s crime. Rayner Goddard possessed that craftsmanship to the utmost. I consider he left us a legacy of justice done by Judge and Jury in this case which was quite faultless. As I say I also believe Goddard’s so called retirement comments when in his 90’s, to be of doubtful authority. At nearing 95 years he was vulnerable to those who wished to misrepresent him innocently or negligently to the public by our media. If he had supported the Jury’s plea for mercy for Bentley, the Chief would undoubtedly have made that wish known to the Home Office through the usual channels. I believe Goddard did not support that plea and thus he had no reason to voice any support of the Jury’s plea. The journalist has ended up confusing us all, but not the Lord Chief Justice Goddard who conducted this murder trial intelligently and behaved sincerely in its aftermath. Contrary to the journalist’s internet garbled account Goddard did not wish to recommend mercy. Why not? Because he was against it. Our Chief would not have stood idly by if he had supported a reprieve for the man he sentenced to death. He did not do things by halves. If Goddard as Lord Chief desired a reprieve Bentley would have been spared you can be sure. Goddard you did not defy as Lord Chief Justice. The journalist could not accept Rayner Goddard’s utter speech and firm arm to strengthen, not weaken, the mandatory sentence of death he had passed on Bentley practically 20 years before. As the trial Judge, Goddard was duty bound to pass that ultimate sentence, and he did not flinch from the trial in 1952 when he donned the black cap to his dying day in 1971 in upholding that sentence of death. Real calibre! The last woman to be hanged. It was always bound to be a difficult case as a crime passionel – she shot her lover. Lord Chief Justice Goddard showed his dexterous touch in allocating the case to Mr Justice Cecil Havers to try. He was proved right, that Judge ensured justice was done in another capital murder trial. Hard and difficult cases may make bad law – they also make strong Judges such as Lord Chief Justice Goddard! What can I say to this Chief, a mere utter barrister myself in criminal law from 1975-82? Yes, you were legendary in my Bar student days 1973-75 I would say properly so. You were the last Lord Chief to conduct a capital trial and sentence the Defendant to death on a guilty verdict. You were prepared to put yourself on the line for the sake of English Criminal Justice in the 1950’s. You have suffered for it, but those who suffer will inherit the Kingdom of Heaven so Jesus said to his disciples. Without any shadow of doubt your exemplary conduct as Lord Chief Justice makes you an outstanding leader of lawyers and laymen. I sincerely salute this Lord Chief Justice who governed with such aplomb our criminal justice from 1946 to 1958 before my time, but such is the glow of his ardour, I feel its power today.